Visiting the surroundings you are immersed in a landscape of the past in which harmony and tranquility reign and where are small villages guardians of history, art and culture still untouched by tourism and so really authentic. 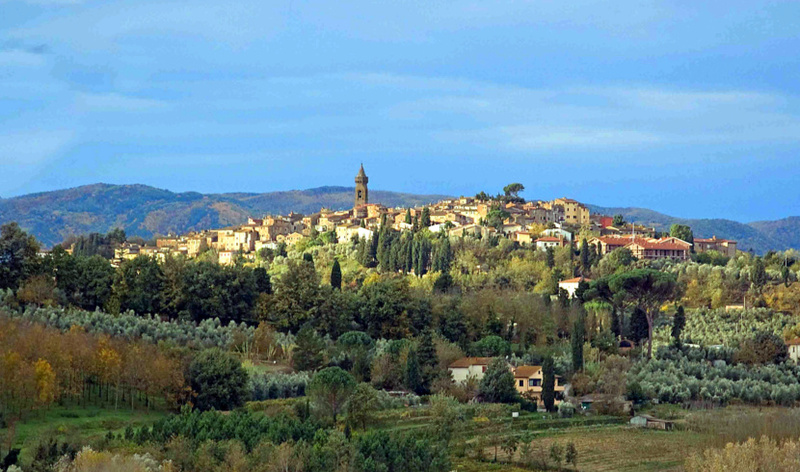 Only about 8 kilometers, stands Peccioli, with its unmistakable profile: the bell tower of the Pieve di San Verano, designed by the architect Bellincioni, which houses precious works of the Pisan school inside, and the centenary pine that stands on the highest point of the town, La Castellaccia, make Peccioli’s profile unique. Borgo awarded with the orange flag, it combines in an original way the ancient and the modern, offering sites of interest such as Palazzo Pretorio and the Museum of Russian Icons, dedicated to Francesco Bigazzi, correspondent from Moscow who donated to the municipality his collection of icons of the nineteenth and beginning of the twentieth century. But my favourite part of Peccioli is the one that looks to the east: narrow, steep alleys of ancient charm that wind through old buildings until open on the beautiful view of valley of Le Serre.